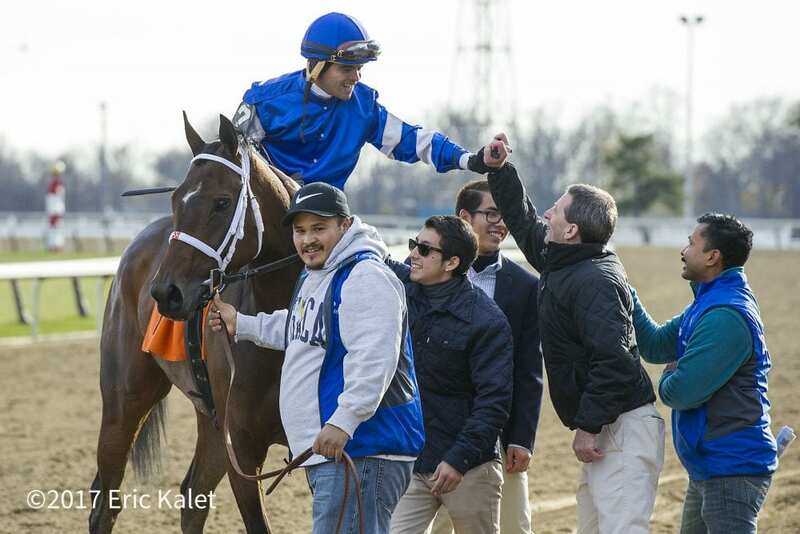 Making her fifth start at Aqueduct Racetrack, Godolphin Racing's Indulgent continued to show her affinity for the Big A, picking up her third win on the surface and first graded stakes victory while capturing the 78th running of the Grade 3, $200,000 Go For Wand for fillies and mares 3-years-old and up on Saturday. Breaking alertly from post 7 with Luis Saez aboard at odds of 12-1, Indulgent remained comfortably in second in the three-path as Lucy N Ethel lead the field of seven through fractions of 23.52 seconds for the opening quarter-mile and the half in 46.82. At the quarter-pole, Indulgent made her winning move to the front. Surpassing Lucy N Ethel at the eighth-pole, she held of a very game Highway Star to secure the victory by a length. She completed the one-mile distance in 1:37.75. Returning $27.40 for a $2 win wager, the Kiaran McLaughlin-trained Bernardini filly is a half-sister to multiple graded stakes winner Frosted. The Go For Wand victory boosted her career earnings to $342,117. “It's very special,” said Jimmy Bell, president of Godolphin USA. “As I'm sure everybody figured out quickly, she has a more famous older brother and to have that filly and the family continue on with her being a graded stakes winner makes a big difference. “I talked to Luis [Saez], and he said she broke very kindly and was right there with him. She settled nicely and responded. It was one of those picture-perfect trips. She stayed out in a good position in a good part of the track and came home fastest of all. Behind Highway Star in second was a late-closing Verve's Tale followed by Going for Broke, Lucy N Ethel, Flora Dora and Jamyson 'n Ginger. This entry was posted in NL List, Racing and tagged Bernardini, Frosted, Go for Wand, go for wand stakes, Godolphin, godolphin racing, indulgent, jimmy bell, kiaran mclaughlin, Luis Saez by Najja Thompson/NYRA. Bookmark the permalink.